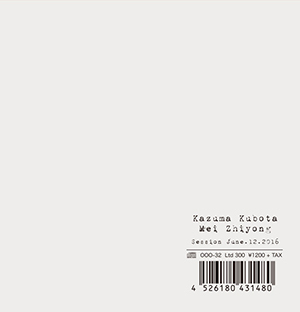 Brainwashed - Kazuma Kubota & Mei Zhiyong, "Session June.12.2016"
Kazuma Kubota & Mei Zhiyong, "Session June.12.2016"
Both Kazuma Kubota and Mei Zhiyong are relatively new to the realm of harsh noise, but they have individually worked with some of the biggest names associated with the genre, such as Macronympha, Torturing Nurse, and Kazumoto Endo (among a multitude of others). This collaborative session is refreshingly no frills and stripped to the barest foundations of what traditional noise is and should be, and at a time in which so many artists are stepping away from the style, it is wonderful to hear something that is as classic and timeless as this. Session June.12.2016 is just that: a recording of Kubota and Zhiyong together working their array of electronics and distortion pedals to create relentless, amelodic sheets of noise and at times piercing, painful tones. The stripped down feel carries into the simple packaging: a plain white sleeve, without any artwork or additional details that is fitting for the unedited, untreated recording that it adorns. Having thrown myself deep into the harsh noise world in the mid and late 1990s, this looks and feels like something I would have randomly ordered via a mailorder like Relapse or Anomalous without fully knowing what I would be receiving, but being very satisfied with myself once it arrived. The duo waste no time in the performance, immediately blasting in shrill and stuttering electronics, with harsh, distorted stabs cutting in to end any semblance of conventional structure or sound. Cuts and edits are violent and jerky, building into painful walls of noise and then cutting them away to more jarring, jagged soundscapes. It is hard to ignore the influence of the classic practitioners of the genre: Kubota and Zhiyong go from the cut-up pseudo-rhythms of Pain Jerk, the manic stop-start structures of Masonna, and the multilayered sheets of noise pioneered by the Incapacitants. The performance never comes across as an emulation of any of these legends, but instead it feels like intentional, reverential nods in their direction. Across the 45 minute session the two never let themselves fall into monotony: shrill, painful high frequencies are soon replaced with massive, foundation shaking low end bursts. Textures resembling rushing waves and sputtering computers appear, as do some nearly psychedelic passages of phaser and flanged layers of static. There is a sense of movement and activity throughout, but also a feeling of consistency and focus. Even with all of these changes, it never feels like Kubota and Zhiyong are just letting the machines do all the work, but that they are actively shaping and structuring the chaos. After a chirp-heavy build it seems to herald the end, with the layers of noise stripped back for the sake of sparser passages, but there’s one last shrill and bass heavy burst left before the two call it quits. Kazuma Kubota and Mei Zhiyong admittedly are not breaking any new ground on Session June.12.2016, but that is not the point. With so many of the well-regarded noise artists either drastically slowing down activity or branching into less abrasive, more musically tinged work, it is simply refreshing to hear an unadulterated pure noise record. No pretense, no attempts at being provocative, simply a disc of extremely varied, high quality noise. It may not be anything wildly unique or innovative, but it is pure comfort food to an old school noise fan such as myself.